For my third Daring Baker’s Challenge we were to make Lavish crackers and a vegan dip. I was excited to try making the crackers but nervous too. I rarely make recipes that include kneading dough because, it intimidates me. I love these challenges because they make me try things I would normally never try. I decided I wanted simple crackers only topped with sea salt and fresh cracked pepper. They were crisp and absolutely delicious. I could have eaten them plain they were so good. 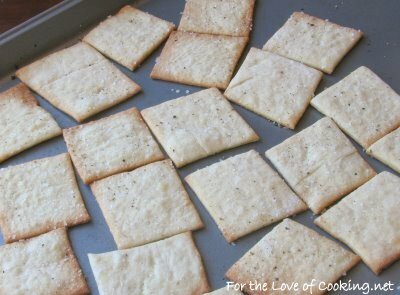 I can’t believe how easy it is to make homemade crackers… I don’t know if I will ever buy store bought again. The vegan dip was easier for me. I have been wanting to make hummus for a long time and this was the perfect excuse to do it. 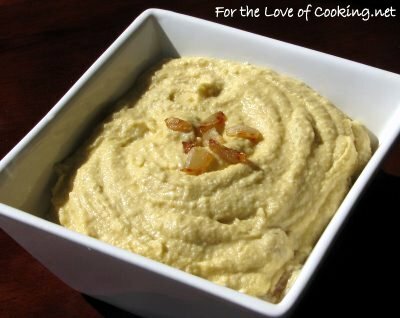 I recently saw a recipe for caramelized onion hummus made by Jeena’s Kitchen, and since I am a HUGE lover of caramelized onions, I wanted them in my hummus. Normally, hummus contains tahini but since I didn’t have any, I decided to make it without. The hummus was really tasty. I loved the garlic/caramelized onion flavor . The lemon juice really added a nice tang and completed the hummus perfectly. I was really happy with the end result of my crackers and hummus. 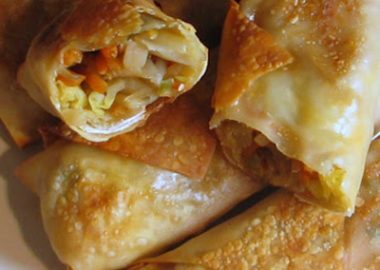 They were extremely delicious and very fun to make. This challenge was hosted by Natalie from Gluten A Go Go, and co-host Shel, of Musings From the Fishbowl. 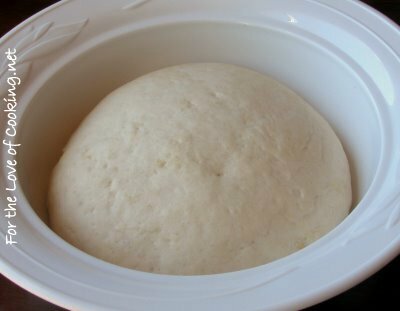 In a mixing bowl, stir together the flour, salt yeast, sugar, oil, and just enough water to bring everything together into a ball. You may not need the full 1/2 cup + 2 tbsp of water, but be prepared to use it all if needed. Sprinkle some flour on the counter and transfer the dough to the counter. Knead for about 10 minutes, or until the ingredients are evenly distributed. The dough should pass the windowpane test (see here for a description of this) and register 77 degrees to 81 degrees Fahrenheit. 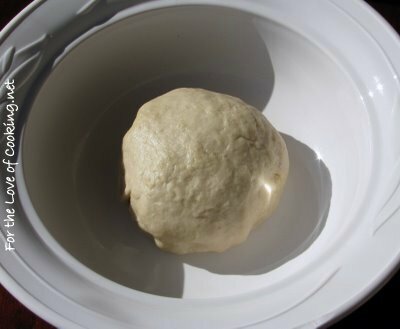 The dough should be firmer than French bread dough, but not quite as firm as bagel dough (what I call medium-firm dough), satiny to the touch, not tacky, and supple enough to stretch when pulled. Lightly oil a bowl and transfer the dough to the bowl, rolling it around to coat it with oil. Cover the bowl with plastic wrap. Mist the counter lightly with spray oil and transfer the dough to the counter. Press the dough into a square with your hand and dust the top of the dough lightly with flour. Roll it out with a rolling pin into a paper thin sheet about 15 inches by 12 inches. You may have to stop from time to time so that the gluten can relax. At these times, lift the dough from the counter and wave it a little, and then lay it back down. Cover it with a towel or plastic wrap while it relaxes. When it is the desired thinness, let the dough relax for 5 minutes. 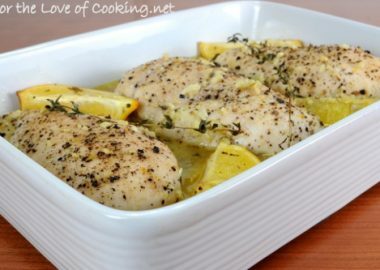 Line a sheet pan with baking parchment or spray with olive oil cooking spray. Carefully lift the sheet of dough and lay it on the parchment. If it overlaps the edge of the pan, snip off the excess with scissors. 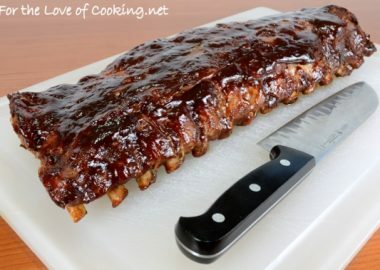 Preheat the oven to 350 degrees with the oven rack on the middle shelf. Mist the top of the dough with water or olive oil cooking spray and season with sea salt and fresh cracked pepper. 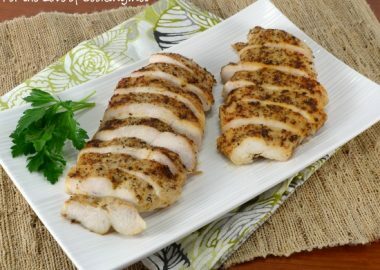 Be careful with spices and salt – a little goes a long way. If you want to pre-cut the cracker, use a pizza cutter (rolling blade) and cut diamonds or rectangles in the dough. You do not need to separate the pieces, as they will snap apart after baking. If you want to make shards, bake the sheet of dough without cutting it first. Bake for 15 to 20 minutes (I checked them after 10 minutes), or until the crackers begin to brown evenly across the top (the time will depend on how thinly and evenly you rolled the dough). Heat 1 tsp olive oil in a skillet over medium heat. Once hot, add the onion and sauté for 20-30 minutes stirring frequently. Once the onions are golden brown and caramelized add the garlic and a bit of salt, stir continually for 60 seconds then remove from heat. 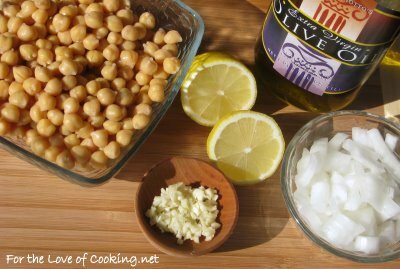 In a food processor (or blender) add the chickpeas, lemon juice, 2 teaspoons of the garlic/onion mixture, sea salt and pepper to taste. 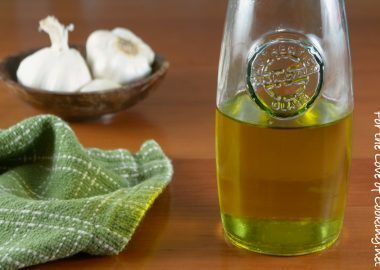 Turn the mixer on and slowly drizzle the olive oil in. 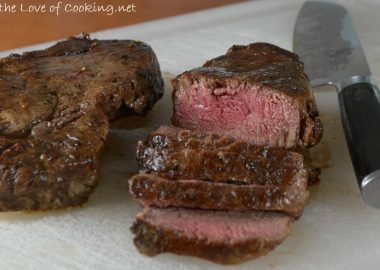 Taste and re-season if needed. Once it’s creamy and smooth, add the remainder of garlic/onion mixture and stir. 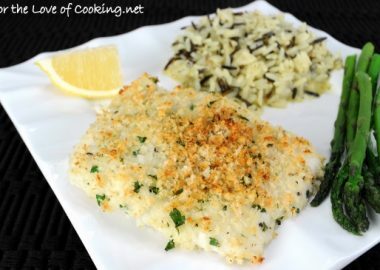 Serve with homemade crackers and enjoy! Those look amazing Pam! 🙂 Kudos, I’ve got to try this. Wasn’t the hummus so good? I have made homemade crackers before and swore I would only make them too! Problem is, they are so good you can’t keep up with how fast they get eaten! Or at least at our house anyway. It all turned out just beautiful! Your crackers are beautiful – so perfect and square! Ooo, your lavash looks amazing, great job!! You make everything look so easy… and so yummy! Have you posted early?? I am making mine today…yours look stunning! yumm! pretty crackers 🙂 they look delicoius, and the hummus looks great, too!!! I have never made my own crackers, Oh.. hummus I love you, I am craving all-things-kosher at the moment, and being in Japan– hard to come by…. Thank you for bringing it to me at least virtually. Lavish indeed and as Elle would say “Fabulous Darling”! Looks good chica, this is one of them I could of actually done, LOL! Looks perfect! I would have thought they were store bought. Great job on the challenge. And the hummus looks fabulous! Pam your crackers came out perfect and your photos make it look so easy. I can only imagine how yummy your dip is. Your crackers are gorgeous, and Jeena’s hummus is unbelievably good. Everytime I see it that’s all I want for lunch, so now I’ve got to have it again. 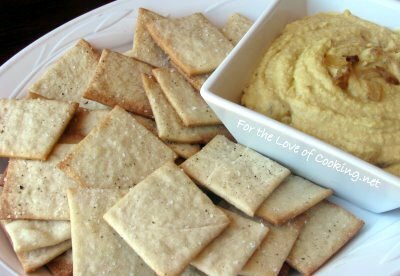 Your crackers turned out great and I am sure the hummus was a fabulous dip to go with! Wow, you made crackers. Now that’s something I could never do!! They look awesome! I never thought of making crackers! They look great. I’ll bet they’d be good with other flavoring, too! that looks delicious!! the hummus looks so good! Well done, Pam. Those crackers look amazing! If you hadn’t shown the steps you went through to make them I’d have sworn you’d bought them. The hummus sounds totally yummy too. How fun to make your own crackers! 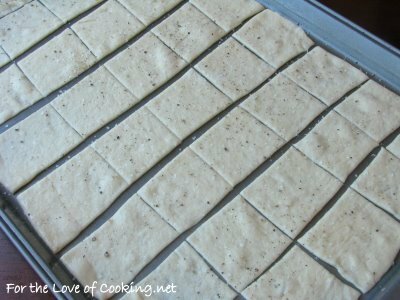 I’ve only made crackers once … it was an Ina recipe and called for cheese and black pepper. OOooh, they were good, just as I bet these are. That hummus looks terrific. I saw it on Jeena’s sight and thought it sounded just great! Love your square bowl! Wow Pam Those LOOK Great !!! Your lavash and hummus look divine! This is just great! What a gorgeous hummus! Welcome to the Daring Bakers. For your third challenge you did a great job. They look really good. That whole snack looks fantastic! Wow! Your crackers turned out so well. Good work! I’ve tried crackers-only once and gave up. 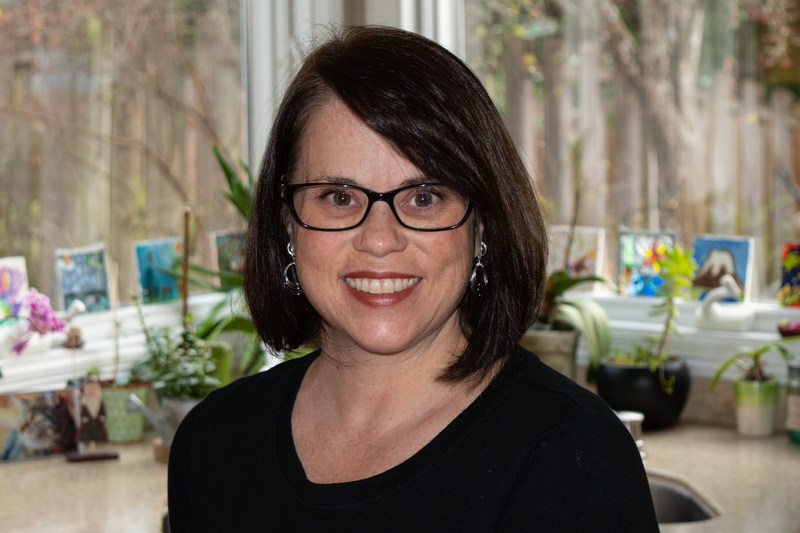 Thank-you for a great blog!